Recognize Healthcare Staff to Retain Valuable Assets! The healthcare industry faces recruitment and retention issues on a regular basis as it has maintained the fastest growing demand for skilled labor over the past decade. Attracting and retaining quality healthcare employees has become increasingly difficult for hospitals and healthcare clinics in this competitive job market. Employee recognition programs are a proven way to help retain workers in the healthcare industry. In a recent study, over one third of respondents cited the same reason for leaving a company- he or she felt they were not recognized by an employee award program at all or on an inconsistent basis. Not only do employees crave recognition for a job well done, but can feel more engaged and productive on a consistent basis when they receive recognition through an employee recognition program, such as a healthcare staff award program. Awards Network continually offers unique employee recognition program ideas to clients in the healthcare industry. Most commonly, healthcare related employers will implement years of service awards for employees reaching milestone anniversaries. A regional health system provider wanted to implement an employee recognition program to help combat the high turnover it was experiencing and improve its commitment to patient satisfaction. 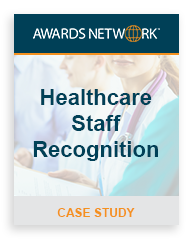 Awards Network designed a cost effective and customized recognition award package for each hospital’s employee award program that is given to employees on their service anniversary. Each employee is presented with the packet containing a congratulatory letter from the CEO, a certificate of appreciation signed by the CEO and a catalog and ordering form for a gift. After 5 years of the initial implementation of the employee recognition program, the regional health system provider has a nursing staff turnover rate of 5.5% compared with the national average of 18% and an overall workforce turnover is 8.7% compared to a 15% industry wide rate. The overall cost of hiring and training employees was reduced in turn, while recruiting costs also declined. This contributed to savings of over 55% in hiring and rehiring costs. Interested to learn how we can help you implement a healthcare staff award program? Contact Awards Network to discuss how our employee recognition programs can work for your organization.